The average person will spend 3.9 years of life staring at a smartphone screen— unless, perhaps, that person has a Punkt MP01. This stylish “dumbphone” from Switzerland can’t take a photo or access the web. It only handles calls and texts. But “repeat after us: ‘Offline is the new luxury,’” and carrying a cheap fiip phone will never adequately convey how little you care for email and Instagram. 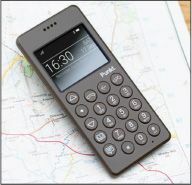 Nokia recently jumped into the dumbphone market with a new edition of the company’s iconic 3310. But does that $60 brick phone come with bespoke birdcall ringtones? The MP01 does.